Joint pain in your dog can come from multiple sources. We will touch on a few potential reasons, with a strong urge to consult with your veterinarian and get an accurate diagnosis of what is causing your dog’s pain. 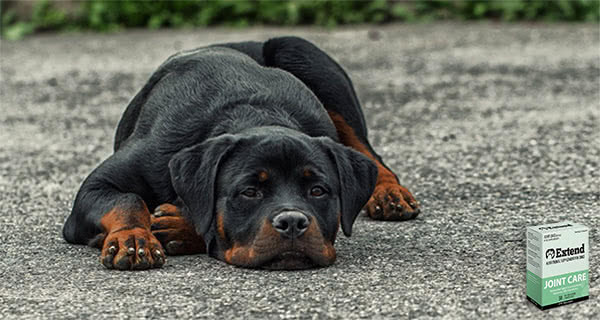 Life of a dog, no matter how active, can take its toll on their joints, especially hips, shoulders, elbows, knees, and back. The world’s healthiest dog is still not immune to the effects of time. And over time, the body breaks down, especially in the joints. Cartilage, the soft, rubbery tissue protecting joints where bones connect, does not have the ability to heal itself and replace healthy cells like skin and muscle. As a dog ages, cells in cartilage begin to die off, which causes a thinning of the protection between bones, and increases joint inflammation. Osteoarthritis occurs when the cartilage wears down to the point bones become exposed. It is a progressive condition that will worsen over time. Medication is the most common treatment for this condition, followed by the less-common surgical procedure. Bone injuries can cause damage to joints in two specific ways. First, a bone fracture can occur in the joint itself, causing direct damage and risks of improper healing, worsening a joint’s health. Second, even if a fracture occurred far from a joint, it could cause imbalances in the bone and joint structure, as fractures never heal without changes to the original shape. 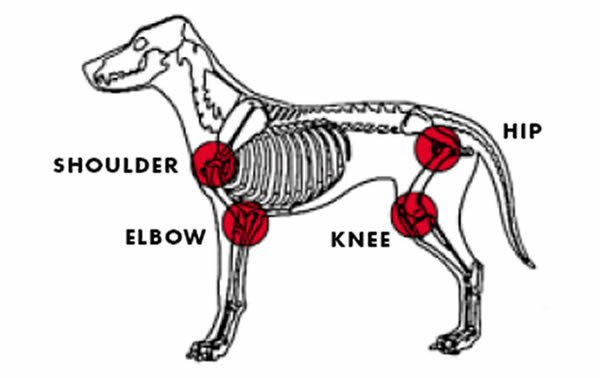 These imbalances cause undue stress on a joint as the dog’s body tries to compensate for the changes. Tendon and ligament injuries, like a torn ACL or PCL, can be painful, though temporary injuries to dogs. Most ligament injuries can return to near 100% funcionality if they heal properly, usually requiring long periods of inactivity. Hormone conditions, cancer, lyme disease, and spinal diseases can each contribute indirectly to joint pain in dogs. These conditions are rare, so we won’t go into detail. But we recommend you talk to you veterenarian if you have questions or concerns. Together you can decide whether or not it would be worth testing for these diseases, even if to simply rule them out as causes. Soften up your home with rugs, carpet, pillows, and a heated bed. No matter the cause of painful joints, Extend™ Joint Care for Dogs is formulated to help ease pain and immobility.